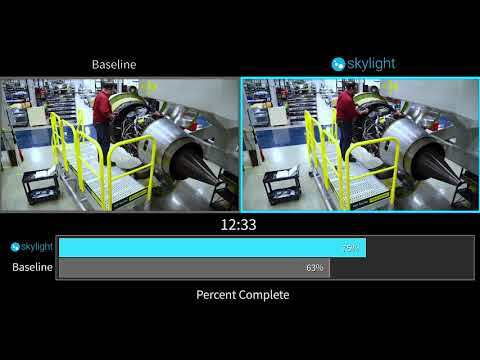 WASHINGTON, July 18, 2017 /PRNewswire/ -- Upskill, the leader in enterprise software for augmented reality (AR) devices, today announced another successful pilot at GE Aviation using the company's Skylight platform on Glass Enterprise Edition. The new use case combined with significant growth in AR and assisted reality implementations across GE, Boeing and many other customers worldwide, is a testament to the immediate return on investment companies in the industrial sector see after deploying Skylight on Glass. GE Ventures first invested in Upskill in 2015. Today, GE, both one of Upskill's largest customers and an investor, is using Skylight in seven active projects at 12 locations globally. These smart glass implementations span a wide range of use cases across GE Businesses—from topbox cabinet wiring, to warehouse picking and kitting, to field repair and maintenance. In the case of GE Aviation, age-old tools are now becoming connected, and interacting digitally with people who build and repair aircraft engines. Mechanics tested Skylight on Glass combined with a WiFi-enabled torque wrench to optimally tighten bolts while performing routine assembly and maintenance tasks. The result, reduced errors at key points in the assembly and overhaul of engines, unlocking millions of dollars in savings both for GE and its customers. GE Aviation also saw an average increase of 8 percent to 12 percent in mechanic efficiency while using the smart glasses, further increasing the operational and financial value proposition. "We believe that Skylight on Glass Enterprise Edition has the potential to be a real game changer in terms of its ability to minimize errors, improve product quality and increase mechanic efficiency," said Ted Robertson, Manager of Maintainability & Human Factors Engineering, GE Aviation. To view the new case study, visit: https://upskill.io/landing/upskill-and-ge/. "Our customers' success is a direct result of Upskill's longevity as a Glass Partner dating back to the Explorer Program. Upskill saw the potential for Glass in the workplace early on and has successfully deployed Glass across a range of businesses to help people be more effective and efficient at their jobs," said Jay Kothari, Project Lead, Glass. "It is exciting to now have Glass available to enterprises who understand the value of how wearables and industrial IoT can transform a business today," said Brian Ballard, co-founder and CEO, Upskill. "Now more than ever, organizations can confidently invest in smart glasses to drive meaningful impact and get the most out of their investments towards digital transformation." Upskill (formerly APX Labs) is the market leader in enterprise software for augmented reality devices in industrial settings. Trusted by the world's greatest companies, such as GE, Boeing, Rio Tinto, and Shell, our industrial AR platform, Skylight, and associated applications including EyeSight, enhance the capabilities of hands-on workers to measurably and immediately improve business operations from the factory to the warehouse to the jobsite. By connecting workers to the information they need to do their jobs with greater efficiency and fewer errors, businesses become more agile and competitive through greater productivity, quality, and compliance. To learn more, visit upskill.io.